Here are some random pictures of Anabelle. This little girl is busy! She is always talking up a storm and is constantly on the go. I will say that she has great manners- "Thank you" for everything and "excuse you" if you do something wrong. She is really into baby dolls. I think I have said it before, but if it is any indication of how she is going to treat Jack, Look out! The other night she did inform Josh and I that she wants a new baby. We told her to ask Santa, so now she continues to ask us then lets us know that she asked Santa Claus, too. When we say our prayers at night, she asks for a new baby and says Amen. If she only knew that she is getting the real thing in about a month and a half! 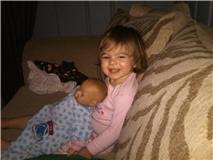 In the den with her baby doll. 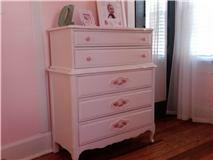 This dresser was Josh's moms as a little girl. With a little TLC, it turned out great! Anabelle is so proud of her big girl furniture. 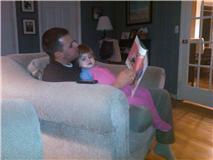 Josh and Anabelle reading in the den. The child loves books!! I just wish she wasn't in love with the same two books- Olivia and Zebra Stripes! I have posted pictures of Anabelle not sleeping in her bed, but here is one of her actually sleeping in the bed. She really seems to like it. As you can see, there is a random assortment of stuffed animals that seem to always make it into the bed, too. 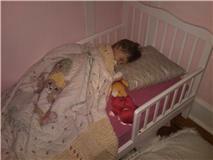 She also sleeps with a blanket that my Mamaw made me when I was little.